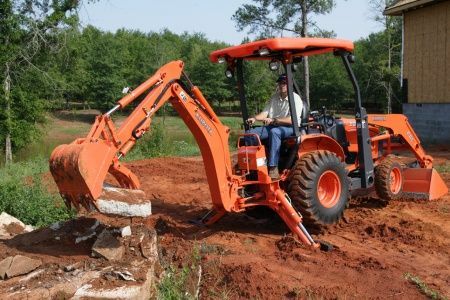 The Kubota B26TLB Tractor/Loader/Backhoe offers the versatility and power you need whether you’re using it for agricultural or commercial work. 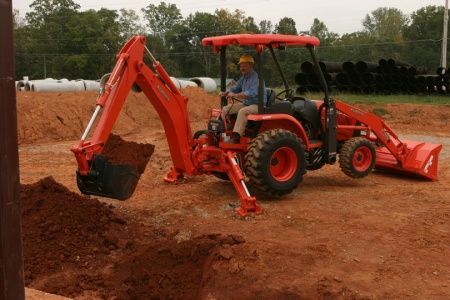 The B26 boasts features usually only found on our larger L-Series tractor/loader/backhoes. 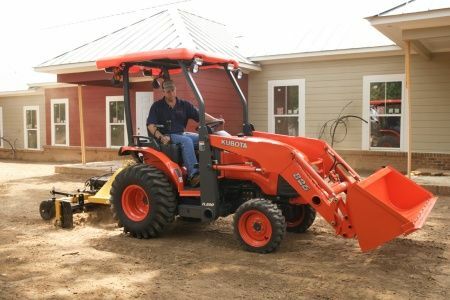 With this tractor you’ll discover increased loader lifting capacity, greater backhoe digging power and depth, more horsepower, a host of new features aimed at operator comfort and safety, and a striking new design. 26HP diesel engine - Boasts an enviable combination of high power, high torque rise, low noise, low vibration and cleaner emissions. Easy to start on cold mornings, this high-output, liquid-cooled engine will prove both dependable and durable for years to come. Slanted Boom and Hood Design - Improves visibility over the hood. 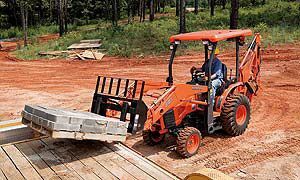 This helps you change attachments and get back to work quickly, and allows increased productivity in tight areas. 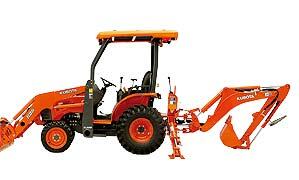 Integrated Main Frame - Performance matched to the loader and backhoe. 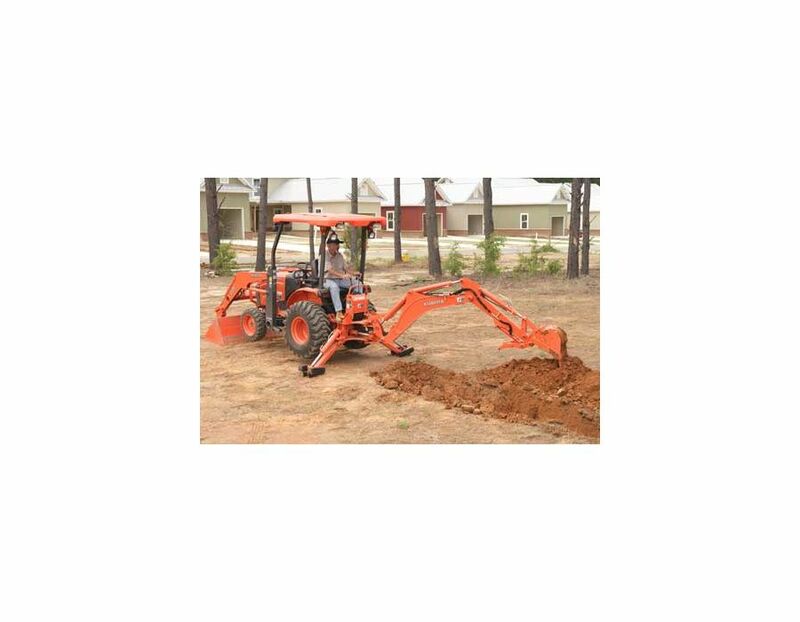 This results in structural integrity which can withstand the stresses of repetitive loader and backhoe work. ROPS/FOPS - The Rollover Protective Structure (ROPS) and the Falling Object Protective Structure (FOPS) come standard on the B26. Besides protecting you from harm, the FOPS canopy also serves as a barrier between you and the elements. Four Wheel Drive - Combined with the differential lock for the rear axle, the B26’s 4WD ensures virtually unstoppable performance under difficult conditions or on varying terrain. Hydraulic Independent PTO - The Independent PTO keeps stopping to a minimum. With this handy feature, you can stay productive by engaging and disengaging the rear PTO without ever having to stop the tractor. Headlights/Worklights - Installed on the canopy and ROPS respectively. The height of the headlights provides greater ground coverage during night work. The rear-mounted work-lights shine brightly for backhoe or 3-point hitch work. 3-Point Hitch - To give you the ability to take on bigger jobs, the lifting capacity of the B26’s Category I 3-point hitch is 1,676 lbs. 24” behind the lift points. 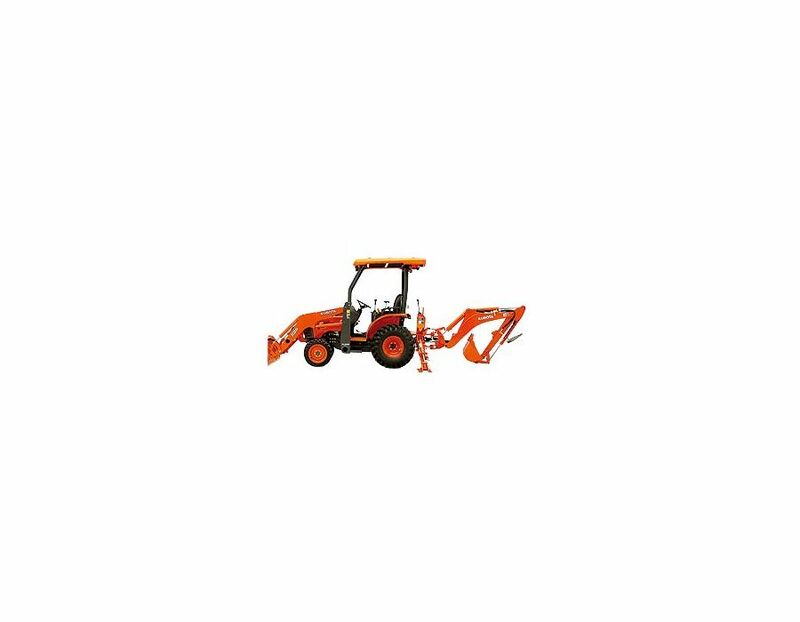 This will allow you to attach a wider variety of Implements and larger implements, for greater productivity. 3-Point Hitch Storage - This standard, Category I 3-point hitch gives you excellent versatility and compactly folds up in the B26’s convenient storage space when not in use. 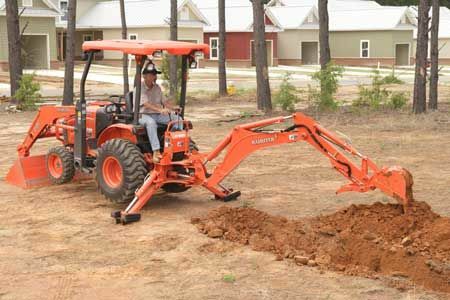 Backhoe Quick-Mount System - Attaching and detaching the backhoe has never been easier than with this quick-mount system. Built-in Loader Valve - Mounted directly to the tractor. In doing so, it protects the valve, thus increasing its longevity. 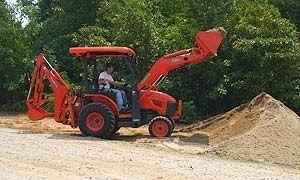 Kubota also improved operator visibility and cleaned up the overall design of the machine. 3rd Function Valve (Optional) - The 3rd Function Auxiliary Hydraulic Valve allows you to do more than ever. 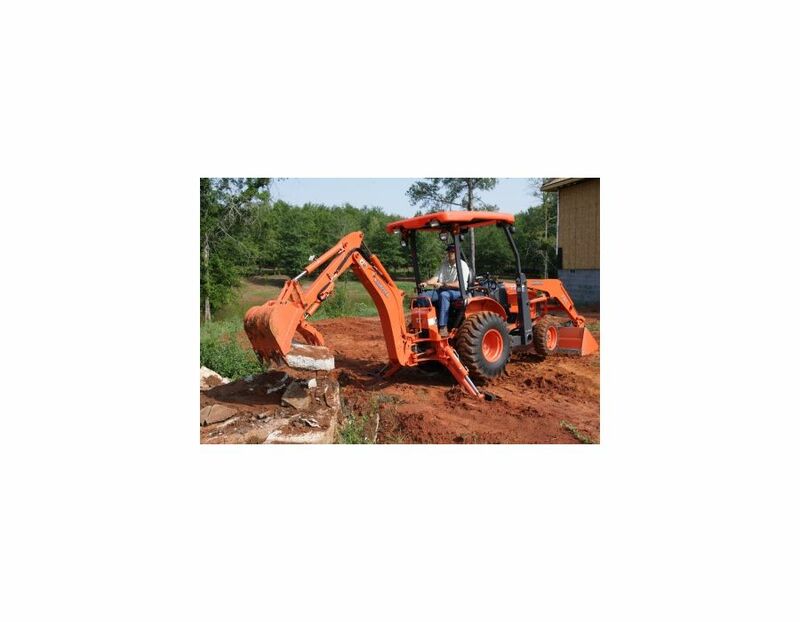 Optional front remotes and the Skid Steer-type quick coupler enable the use of a 4-in-1 bucket, grapple bucket and various other hydraulically controlled implements. The 3rd Function Valve can be easily activated with a button located on the grip of the loader joystick. 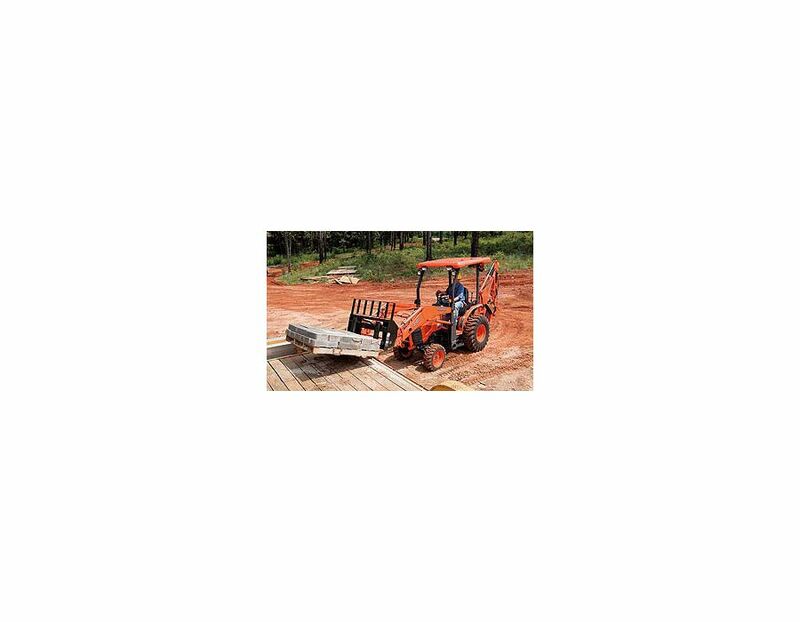 Skid Steer-type Quick Coupler - A high-end feature, the Skid Steer-type quick coupler, allows you to easily change between implements like a pallet fork, bale spear, 4-in-1 bucket, grapple bucket, blade or post-hole digger without tools. Simply set the two locking levers and attach hose couplers, and you’re on your way. 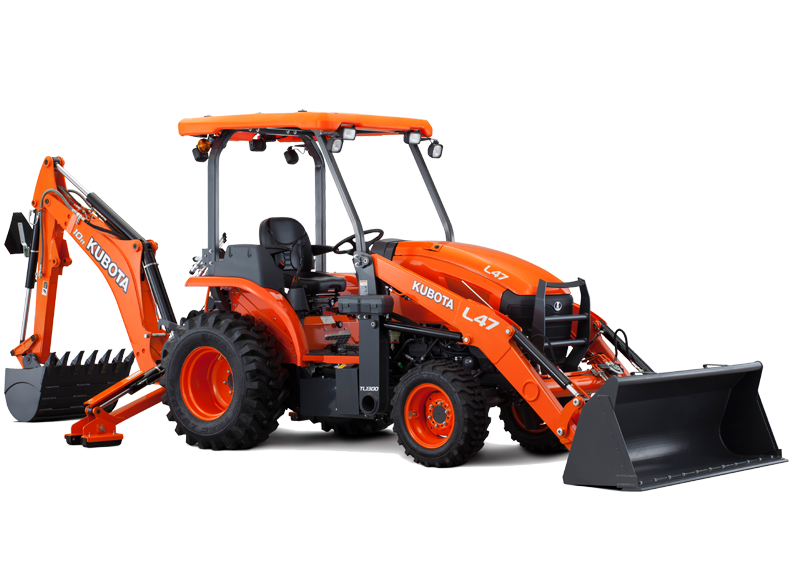 Lifting Capacity and Height - The loader on the new B26 has a lift capacity of 1,100 lbs. 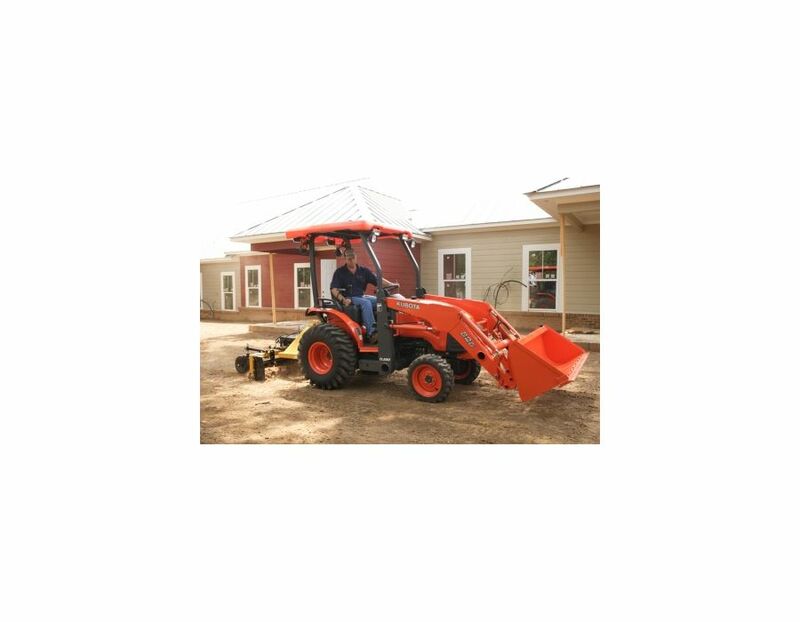 This allows you to handle heavy loads and gives you more power on any job. The lift height of 7' 10" is the best in class. 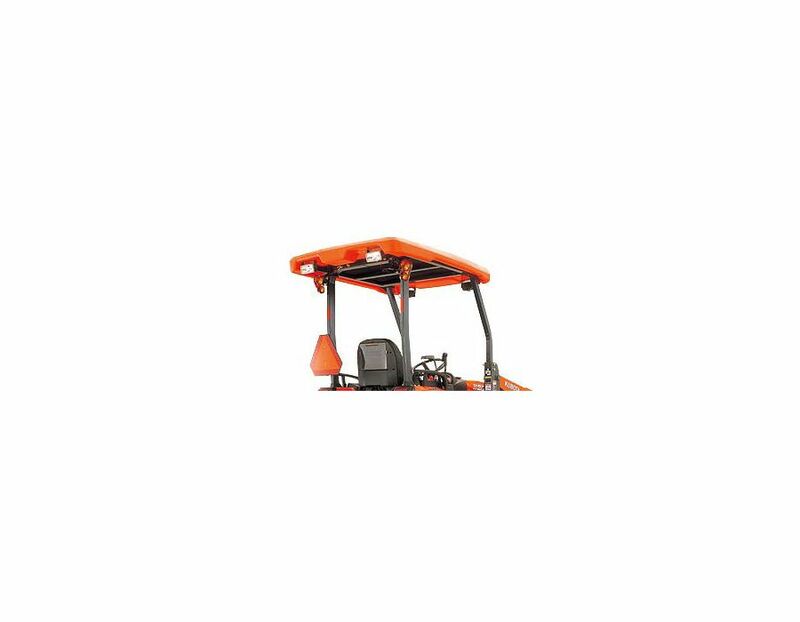 Mechanical Spill Guard - The B26’s Mechanical Spill Guard tilts the bucket forward as the loader is raised, thus reducing the spillage of the bucket’s contents. This makes filling and dumping easier and increases efficiency. Front Guard - This rugged front guard protects the B26’s most vital parts in case of a collision. It also perfectly complements the new slanted hood design. 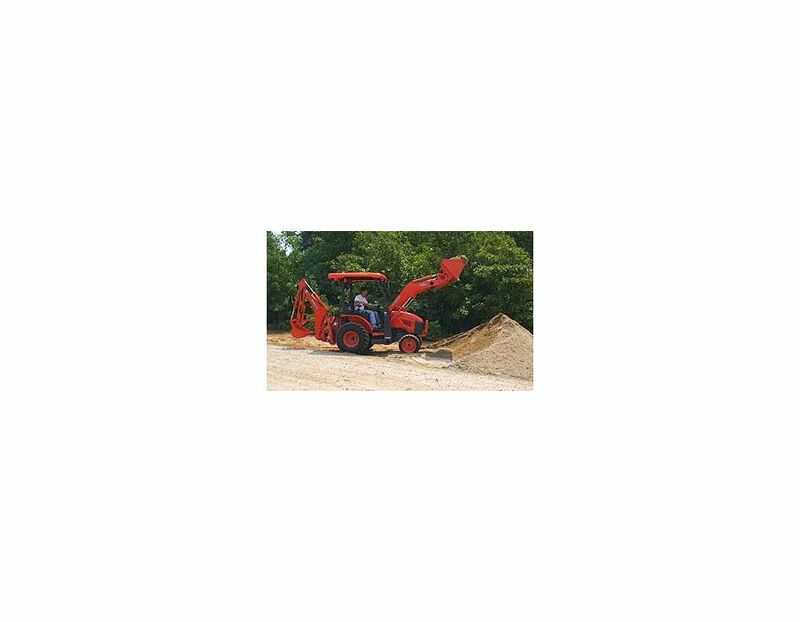 Lubrication Points - Lubrication points on the loader are conveniently located, eliminating the need to re-position the loader during lubrication. Enclosed Hoses - The loader’s hydraulic hoses are routed through the B26’s mainframe. This not only protects them and adds to their longevity, it also gives operators a cleaner and clearer line of sight in front of the tractor. Spark Arrestor - Mounted under the hood, the standard Spark Arrestor muffler reduces fire hazard when working around dry fields or grass. 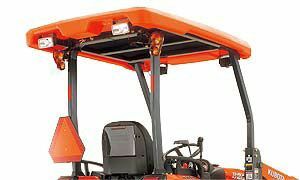 Braceless Frame - The brace-less loader frame design improves visibility and offers easier access under the hood. Deluxe Seat - More comfortable and ergonomic seat with more cushioning to reduce fatigue, even when working long hours. Bucket-Level Indicator - New and improved bucket-level indicator. Located on the loader lift arm, the rod indicator of the B26 gives you the ability to check level when you’re using other implements like the pallet fork, and allows you to more easily check level when using the bucket. Console-Mounted Loader Joystick and Armrest - Just like larger tractors, the loader joystick is mounted on the console at the operator’s right side. Positioned next to the joystick, a sturdy armrest reduces arm movement and fatigue, providing the comfort and support you need for long workdays. Engine Start Switch - Moved the starter switch to the right side of the operator seat, to make it easier to reach when you’re operating the loader or the backhoe. 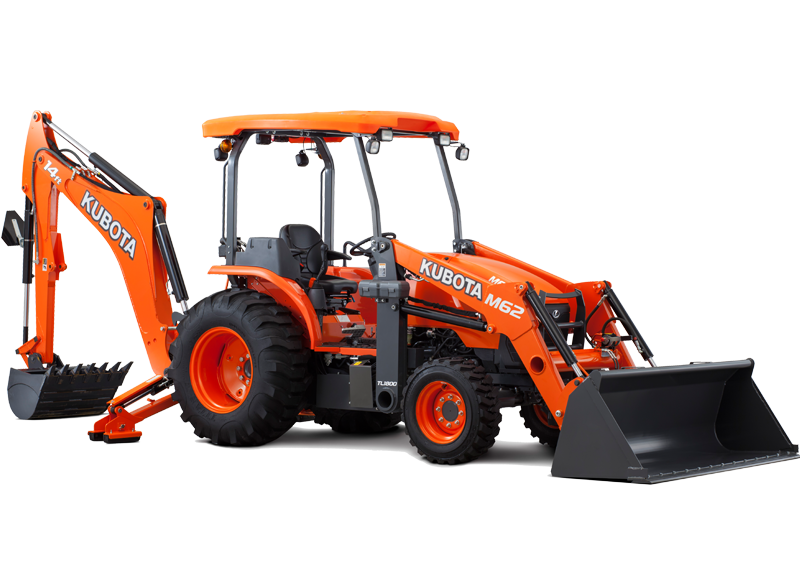 The B26TLB Kubota Tractor/Loader/Backhoe is available at Kooy Brothers Equipment Ltd. located at 1919 Wilson Avenue in Toronto, Ontario.